Author(s): Lichun Sun, Cui-Yun Yu, Institute of Pharmacy & Pharmacology, Department of Pharmacy, University of South China, Hengyang, 421001, China. L. Vienna Mackey, David H. Coy. Multiple Gαi protein-coupled somatostatin receptors (SSTRs) are expressed in human kidney and liver tissues. Also, aberrant cAMP signaling has been shown to play a critical role in cysto-genesis and enlargement of the human kidney and liver. Thus, somatostatin (SST) analogs become potential and promising alternatives in treating human polystic kidney disease (PKD) and polycystic liver disease (PLD) via interacting with Gαi protein-coupled SSTRs and further blocking cAMP production. Lanreotide is a synthetic, long-acting SST analog with high binding affinity to SSTR2, and has been clinically approved for the treatment of acromegaly due to excessive growth hormone. Recently, this SST analog has been applied in the treatment of PKD and PLD, and has shown an effective reduction of liver and kidney volume compared to placebo. This review will discuss the discovery of this peptide and its clinical applications in the treatment of PKD/PLD patients. Keywords: cAMP signaling, Lanreotide, Polycystic kidney disease, Polycystic liver disease, Somatostatin, Somatostatin receptors. Affiliation:Institute of Pharmacy & Pharmacology, Department of Pharmacy, University of South China, Hengyang, 421001, China. Keywords:cAMP signaling, Lanreotide, Polycystic kidney disease, Polycystic liver disease, Somatostatin, Somatostatin receptors. Abstract:Multiple Gαi protein-coupled somatostatin receptors (SSTRs) are expressed in human kidney and liver tissues. Also, aberrant cAMP signaling has been shown to play a critical role in cysto-genesis and enlargement of the human kidney and liver. Thus, somatostatin (SST) analogs become potential and promising alternatives in treating human polystic kidney disease (PKD) and polycystic liver disease (PLD) via interacting with Gαi protein-coupled SSTRs and further blocking cAMP production. 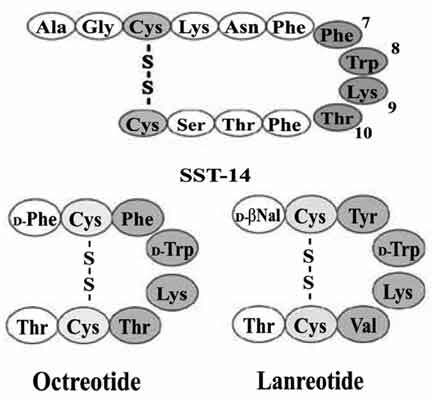 Lanreotide is a synthetic, long-acting SST analog with high binding affinity to SSTR2, and has been clinically approved for the treatment of acromegaly due to excessive growth hormone. Recently, this SST analog has been applied in the treatment of PKD and PLD, and has shown an effective reduction of liver and kidney volume compared to placebo. This review will discuss the discovery of this peptide and its clinical applications in the treatment of PKD/PLD patients.